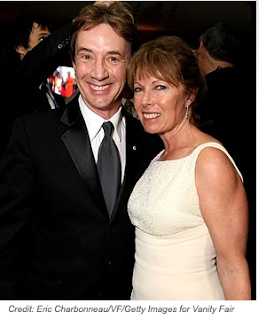 Martin Short's wife of 30 years, former actress Nancy Dolman, has died, the actor's rep tells UsMagazine.com. She passed away Saturday at the couple's home in Pacific Palisades, Calif.
Nancy, 58, had been battling cancer since 2007. The two, who met during the 1972 Toronto production of the musical Godspell, had three children together: Katherine, 26; Oliver, 24; and Henry, 21.